Heavy Things in the Temple? 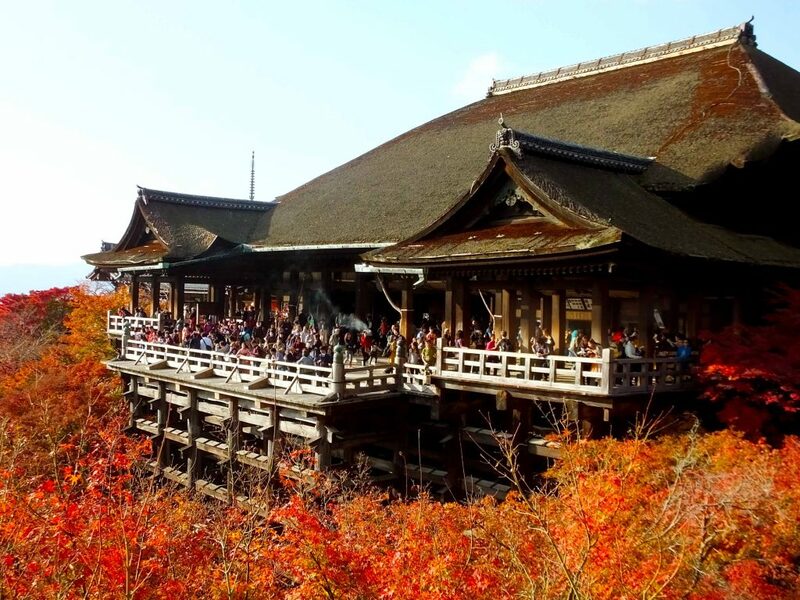 Every autumn, a great number of people around the world visit Kiyomizu-dera Temple to see the incredible architecture with beautiful autumn leaves. 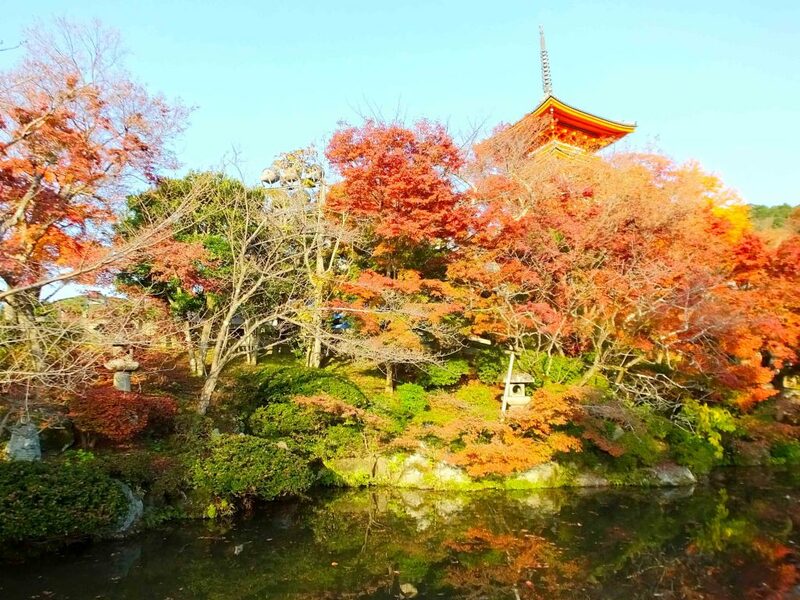 I went there as well, and was overwhelmed with the view of the temple and autumn leaves. The adult admission is 400 yen. 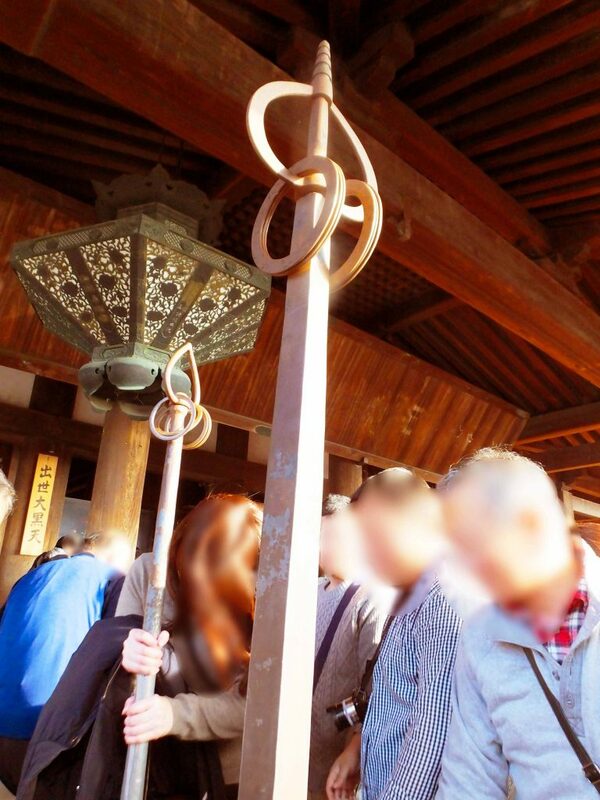 Soon after entering the temple, you will see something interesting—heavy poles. The shorter pole weighs 14 kg, and the longer one, over 90 kg. Maybe even some women can lift the shorter one, but the longer one is too heavy to lift. You should try when you go there. Also there are something like tall clogs. They weighs 12 kg. 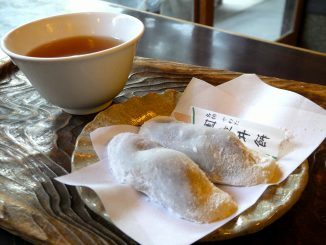 Actually, all of them were offered by an ascetic in the Meiji Period (1868—1912). Had he trained using these heavy things? I’m sure it is impossible! 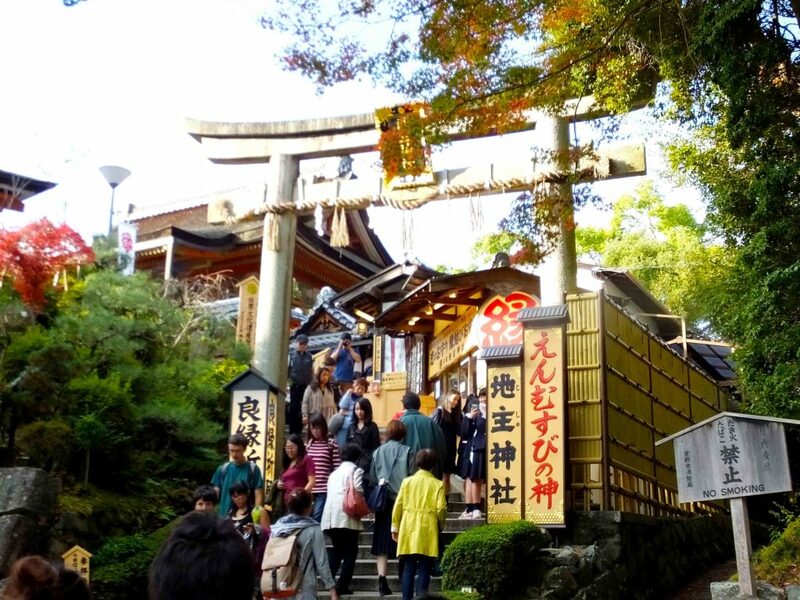 What Is ‘The Stage of Kiyomizu’? The main hall of the temple stands on the steep cliff of Mt. Otowa, but don’t worry about it. It is highly earthquake-resistant. In front of the main hall, a broad veranda overhangs. This is called ‘The Stage of Kiyomizu’. 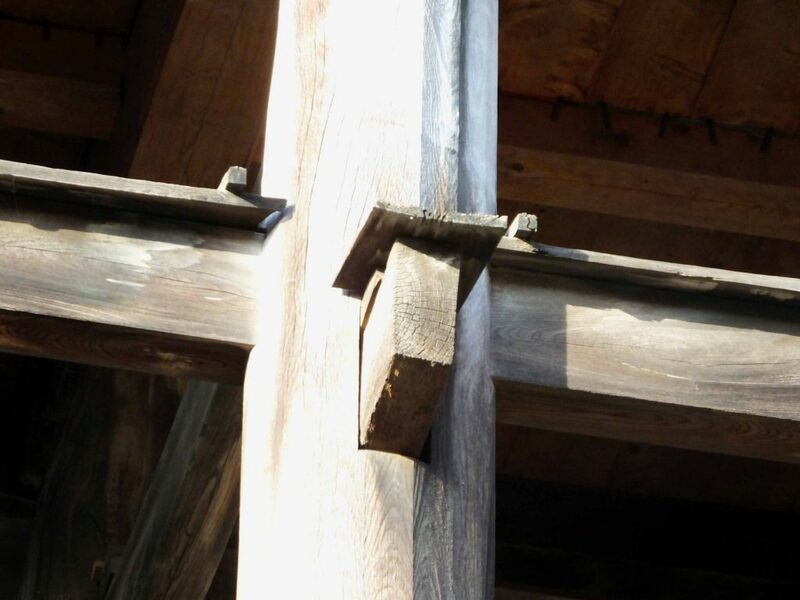 It is supported only by wooden pillars, and has survived since 1633, though hundreds of disasters have occurred. What is the secret of the structure? As you see in the picture, many bars penetrate through each pillar, and small roofs protect the bars from rain. What is amazing is that nails are never used so as to strengthen the overall structure. The stage is about 4-stories tall. In Japan, some people say “as if jumping from The Stage of Kiyomizu” as an expression of determination. When you become resolute in something, you can say this phrase, but do not actually jump from the stage. It is extremely dangerous. Next to The Stage of Kiyomizu, there is Jishu Shrine. 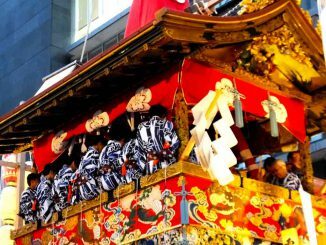 The shrine is well known as a place to pray for luck in love, so it is always crowded with many people, especially young women. It is very rare that you can enter a shrine from a temple. It is interesting. Look at the picture. There stands Koyasu Pagoda on a hill in the temple. ‘Ko‘ of ‘koyasu’ means ‘a child or a baby’ in Japanese, and ‘yasu‘, ‘safe’. Those who hope to have a safe delivery visit the pagoda to pray. 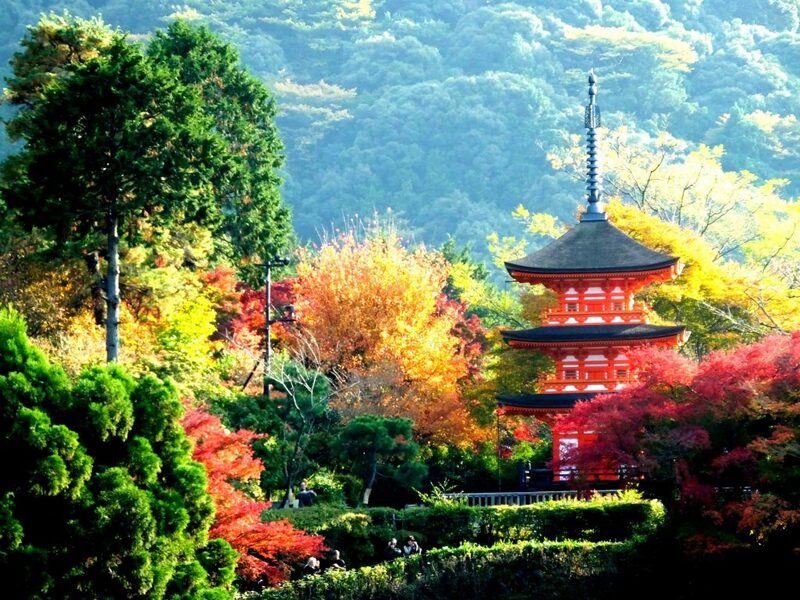 I liked the view of a pond, colored leaves and a pagoda. The pagoda in the picture is not Koyasu Pagoda. This is what we call ‘Three-storied Pagoda’ at Kiyomizu-dera Temple. 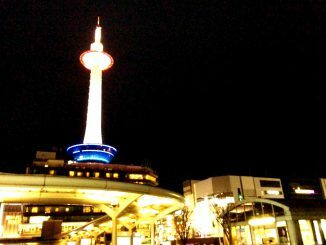 It is 31 meters tall, and the tallest three-storied pagoda in Japan. You can see the whole pagoda near the front gate. 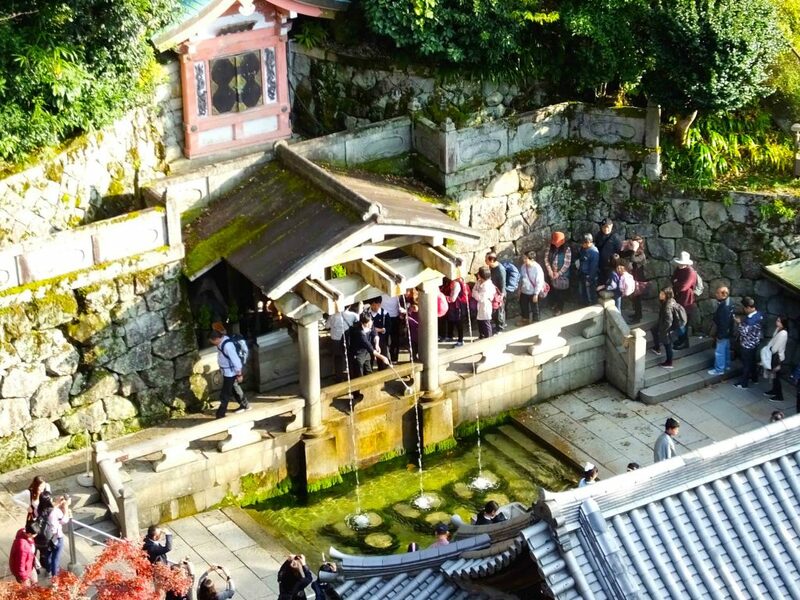 Below The Stage of Kiyomizu, people were gathering to drink water from the streams called Otowa no Taki. Kiyomizu-dera Temple takes its name from the purity of the water there. Actually, ‘Kiyomizu‘ means ‘pure water’ in Japanese. Some people believe that the right stream will bring you longevity, the middle one, luck in love, and the left one, an academic success. You are supposed to drink from only one of them. 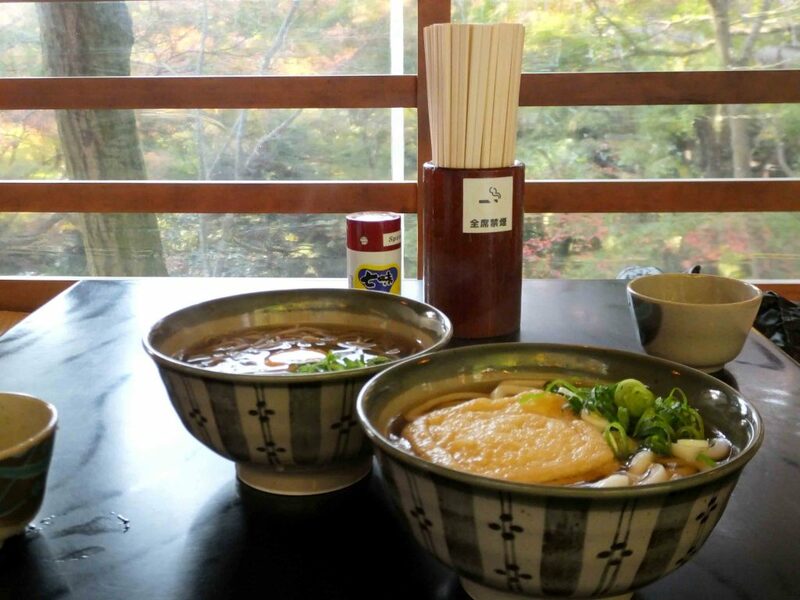 Near Otowa no Taki, there is a restaurant, Takinoya where you can enjoy Japanese noodles, bean curd (tofu) and sweets. 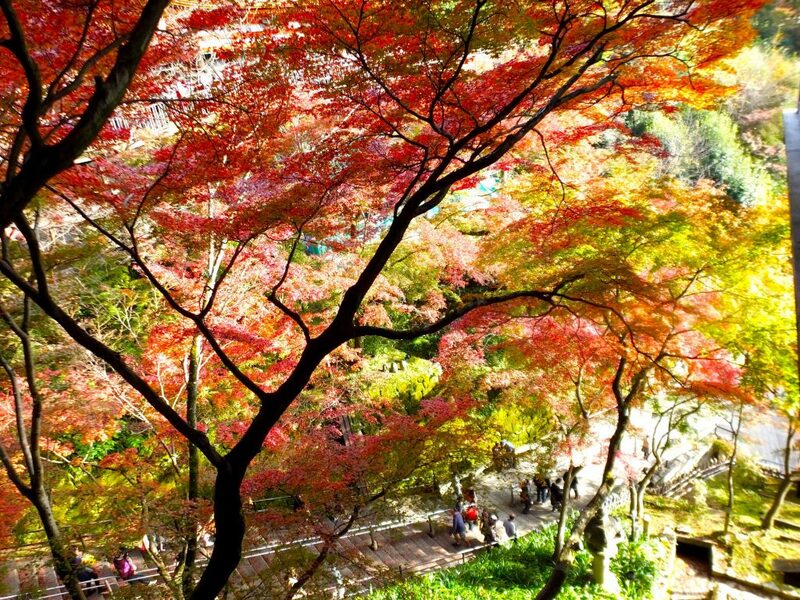 It is a good idea to take a rest and relax in autumn leaves there. The restrooms are located near Takinoya. At Takinoya, I had udon noodles with a thin slice of deep-fried bean curd (tofu). You can see them in the right bowl in the picture. They look tasty, don’t they? The other writer had soba noodles in the left bowl. Soba noodles are thinner than udon noodles. After having fun in Kiyomizu-dera Temple, I also had a great time walking around the temple. 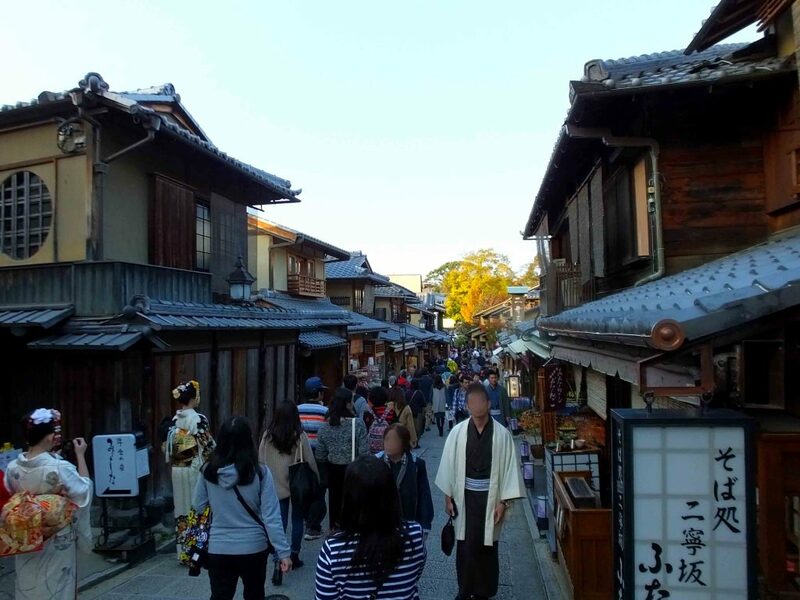 It is very Kyoto-ish to stroll on such a narrow street lined with stores. Yasaka Pagoda of Hokan-ji Temple is a symbol of Higashiyama area. I took the next picture as I was strolling around Kiyomizu-dera Temple. 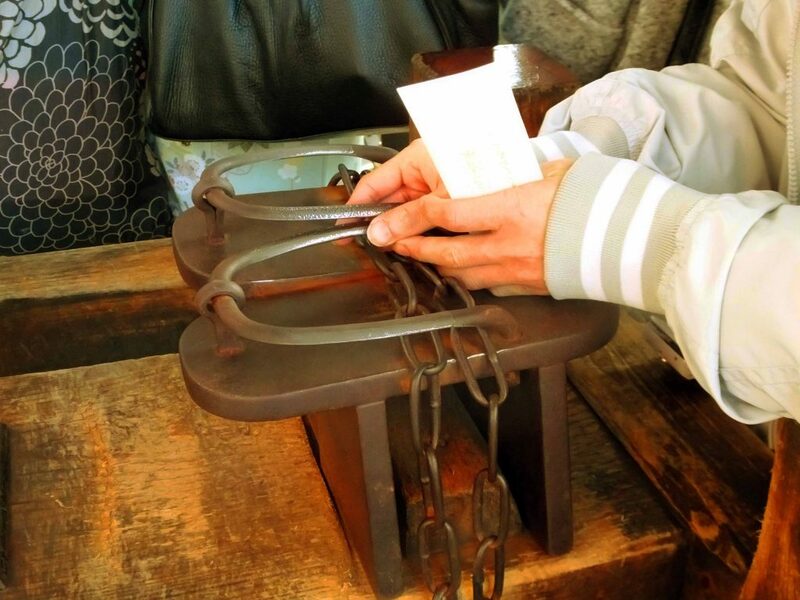 It is located between Kiyomizu-dera Temple and Yasaka-jinja Shrine. 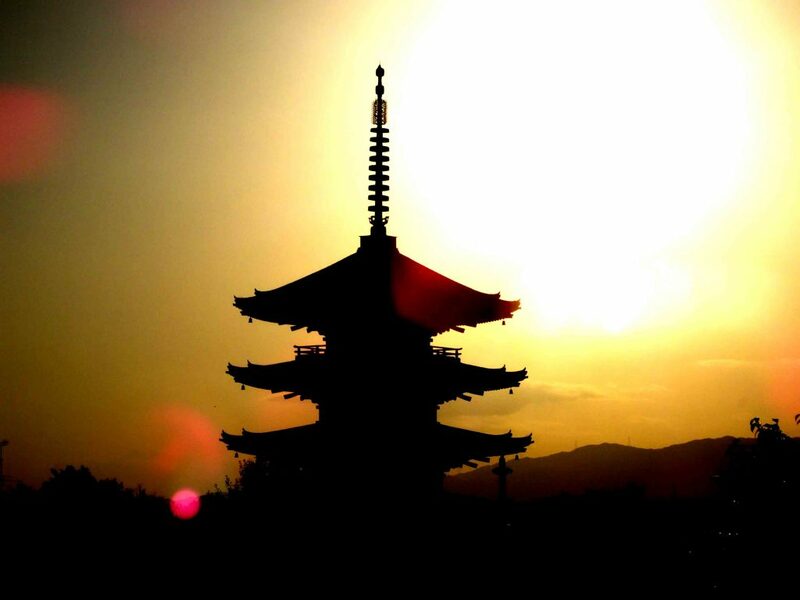 The five-storied pagoda is 46 meters tall. 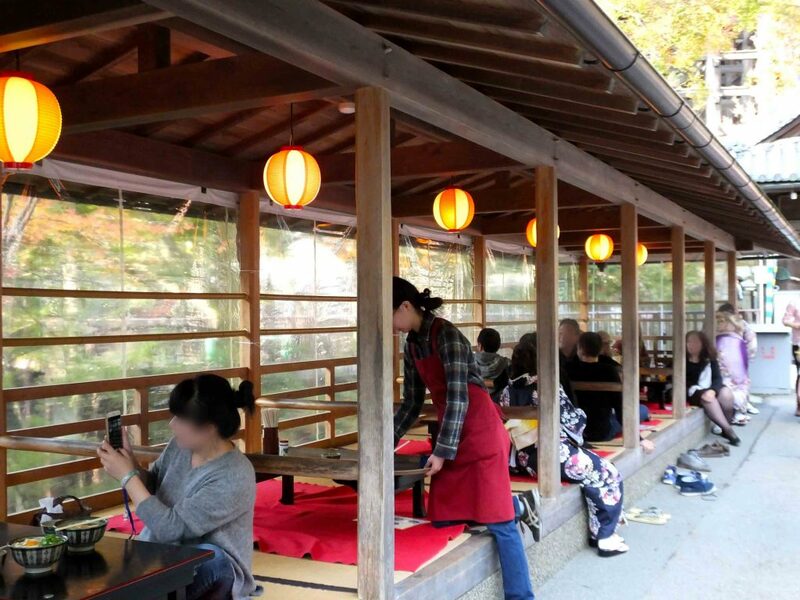 I believe you can enjoy in and around Kiyomizu-dera Temple. 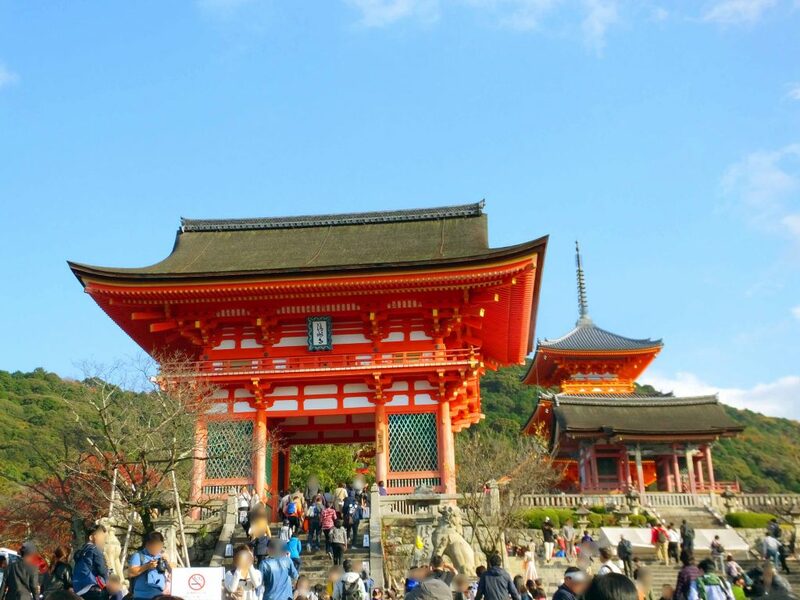 If you are traveling to Kyoto, be sure to visit Kiyomizu-dera Temple. It is too famous and popular to miss.